Users have the ability to edit their own settings within wMobile Phone and Desktop. 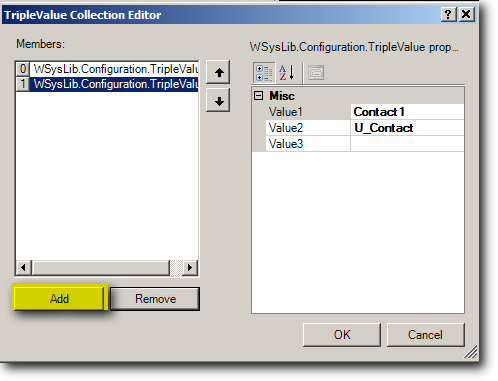 However, it can also be done administratively in the wMobile Manager Console. 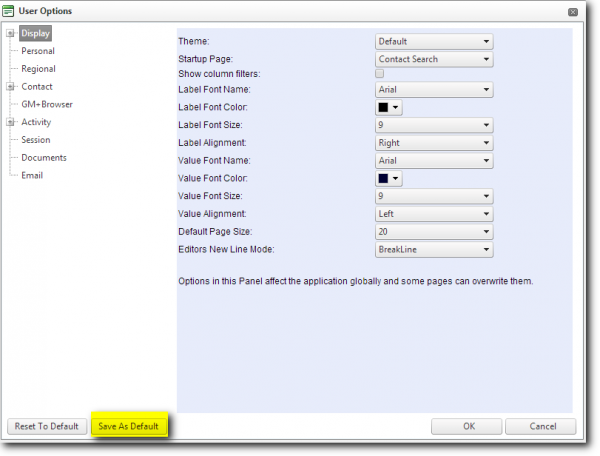 There are two options to do this: Default User Options and User Options as shown below. 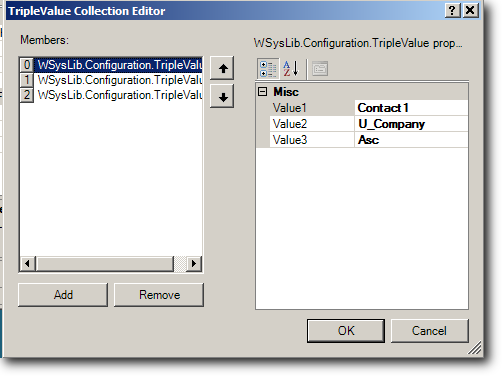 Default User Options can be used to set a preference and apply it to all users at once. 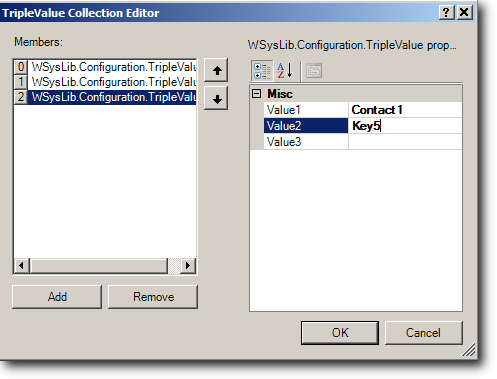 Users Options can be used to set a preference for an individual user. Each user will be displayed on the drop-down list. Select a user to edit. Once you select a user, the options that can be edited will appear on the list. 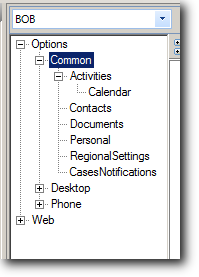 The Common section contains settings that are common to both Desktop and Phone Editions. There are sections for Desktop and Phone specifically. 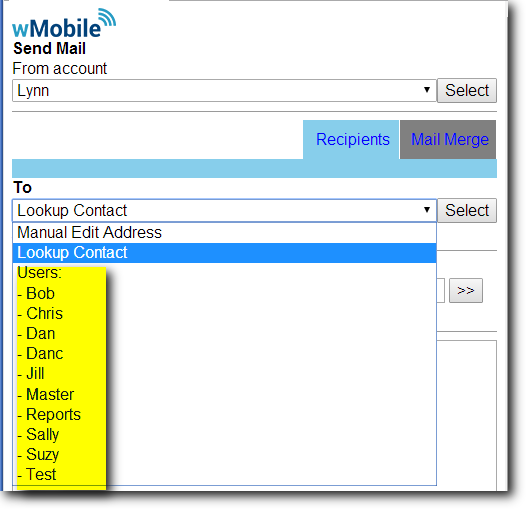 As an example, we’ll display the GoldMine Inbox in the wMobile Phone main menu for user BOB. We’d set this value to True as shown below. Click Save for this change to take effect. There is also an option to Reset to default. This would reset BOB’s settings to the current default. Users with master-level rights in wMobile can make settings changes within Desktop edition and Save as Default. This default could then be applied to other users. An individual user could use the Reset to Default option within the user options in Desktop. Or an administrator could apply this from the top level of the user options as shown below. Sometimes it’s helpful to be able to make changes to all users’ preferences at once. 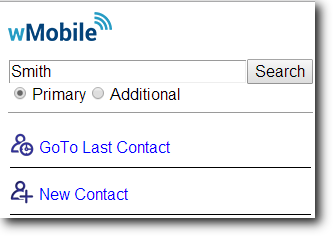 Select wMobile at the top of the wMobile Explorer pane in the wMobile Manager console. Select Default User Options. As with the individual User Options (and System Settings), there are 3 sections that can be edited – Common, Desktop, and Phone. Now we’ll review some examples of settings that might be set for all users. Let’s say that all users want their activity notes to carry over when they schedule follow up activities. This option is listed under Common | Activities as shown below. Set the value to True as highlighted in yellow. To apply to all users, click on Apply to all users as highlighted in green. In some cases, you’ll be prompted to confirm your choice. The option to Apply to all users is applied to the highlighted setting, not all the user settings. So if there are multiple settings to be changed, you’d need to use Apply to all users each time. When you click on each item, you’ll see a description below of the application behavior that is controlled by the setting. 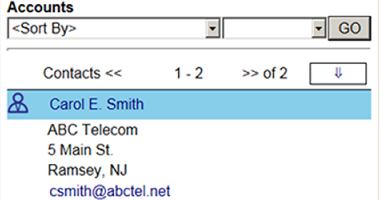 The Additional Contact Fax field can be displayed as “Mobile” or “Cell”. This is a common setting in GoldMine and wMobile since there’s more need to keep track of mobile phones than Fax numbers these days! 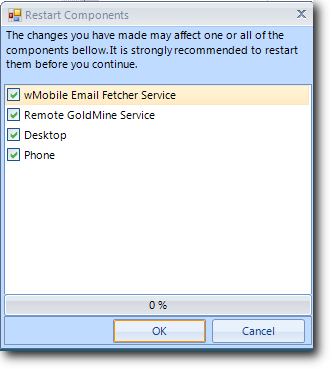 There are some common preferences for email in wMobile Desktop. In new installations, some of these are set by default. 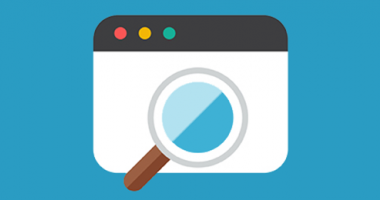 We recommend “OpenComposeMethod” and “OpenViewMethod” to be set to “NewBrowserWindow.” This way when a user composes a new email message, or opens an email message, it opens in a separate tab or window. That way when the user is done, he doesn’t have to wait for the email Inbox to be refreshed before proceeding. He or she can move right on to the next email message. Many customers also like to show the GoldMine Inbox in the wMobile Desktop Email Center. Also in Desktop, you can set the email client preference. If there was a change in your corporate email usage, you could do this for all wMobile users at once. Selecting “Built-in “ will use wMobile’s Built-in email client. 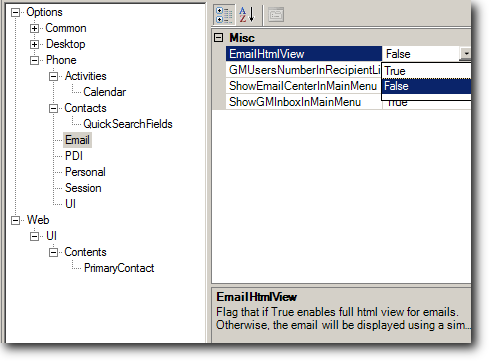 Selecting “External” would use the default email client such as configured on the computer, iPad or tablet. 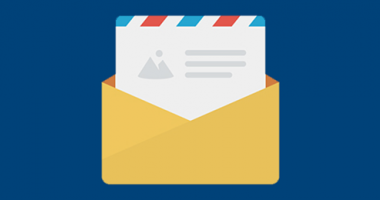 When a user clicks on an email address in wMobile desktop, either the Built-in or External client will open the draft email message. If the setting were set to “External” and the laptop default email client was Outlook, then the email draft would be opened in Outlook. In the event that there’s a standard set of tabs that users should see, a master level user could select those tabs in Desktop Edition and use the Save as Default option as discussed above. 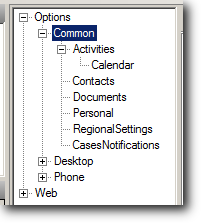 Then the tab selection could be applied to all users by highlighting that section of the Contacts settings as shown below and selecting Apply to all users. There’s a setting that will control how long to stay logged into wMobile Desktop when the user is inactive (not clicking, typing, scrolling, or selecting menu options.) In cases where customers are short on GoldMine licenses, they might want a shorter KeepAliveDuration in order to free up the license sooner. If there are plenty of licenses, then you might extend this time to preserve your work if you get interrupted. Now we’ll move onto some common settings in Phone Edition. By default, the Phone Edition Quick Search searches on the Company, Contact, and City fields. These fields can be customized and added to. There’s no limit on the number of fields that can be searched, but if you select more than a few, it won’t be so quick. To change the Quick Search fields, click on Primary Search Fields line and click on the browse button, the button with 3 dots as highlighted in yellow below. You’ll see each field listed. Let’s say you don’t need City in the Quick Search. Highlight that option, the third in the list, and select Remove. Perhaps you use GoldMine’s Key5 field as an accounting Account ID field and would like to add that instead. Click on Add. 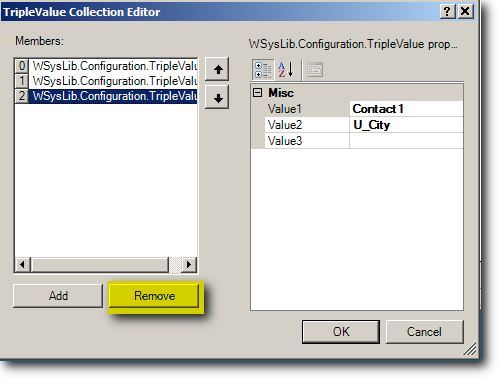 Type in the Table in Value1. In this case, the field is in the Contact1 table. 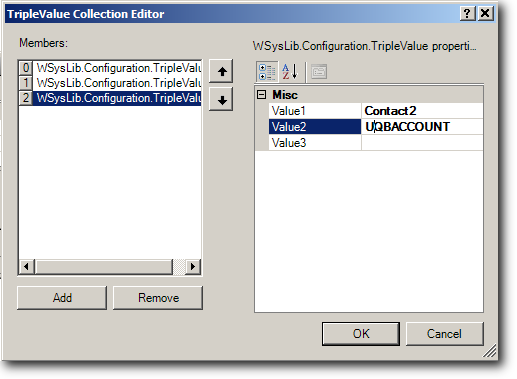 Type in the field name in Value2. Reminder: Select Apply to all users as described above. In this case, you’ll be prompted to restart some wMobile components for the change to take effect. Click OK to proceed. After the restart, this field will be used in the QuickSearch. 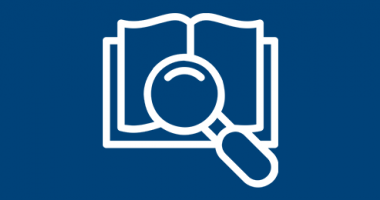 Perhaps you want to use a custom field in your search, an example is provided below. There are a couple of email settings that might be of interest to some customers. By default in Phone Edition, email is set to display in Plain text so it’s fast. A user can select to see an individual email in html to see graphics and formatting. 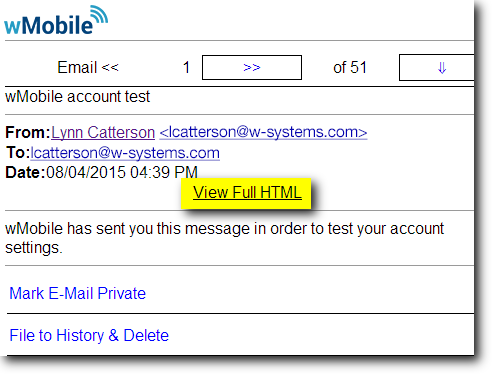 It is possible to set wMobile to display all incoming email in HTML format by default. Keep in mind that this will be slower on most phones. 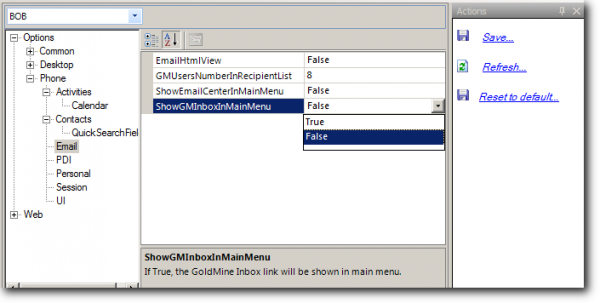 There is a new setting to control the number of GoldMine Users that is displayed when sending GoldMine email. The default number was 4, but now be increased. The setting is here in the Default User Options. 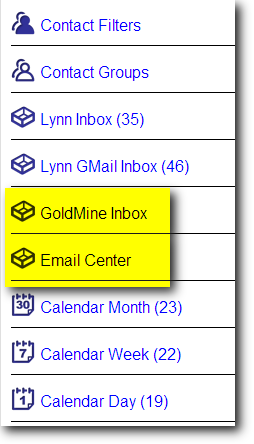 Many customers like the GoldMine Email Center and/or GoldMine Inbox to be displayed in Phone Edition on the main menu. Users with multiple email accounts might like to see the Email Center displayed for ease of selecting a specific account or GoldMine inbox. This is often a personal preference, since the more options there are, the more scrolling there is to do. However, the options are available here in the Manager Console. There is a separate email client setting in Phone to use wMobile’s BuiltIn email client or the external client on the mobile device. There are separate settings since someone might use Outlook on a laptop, but wMobile or the native email client on a phone. There is a separate setting for Phone Edition to control how long a user should remain logged in when inactive in wMobile. Armed with these options, you should be able to adjust individual or all users settings from the wMobile Manager Console without needing to log into wMobile as the user.